Golf - Halifax & Huddersfield v Leeds at Bradley Park GC. James Edward from Huddersfield GC. The Halifax-Huddersfield Union side is celebrating a memorable first away win for a couple of years with a 21-15 success over East Riding on Sunday. What made the victory ever more pleasing for team boss Frank Greaves and his players was that their hosts at Hull GC were top of the Yorkshire Inter-District League prior to the contest. The visitors led 7-5 after the foursomes and then won seven of the 12 singles contests. Halifax Golf Club’s Mark Birkett and Fixby’s former Crow Nest Park player James Edwards were successful in both the morning and afternoon. 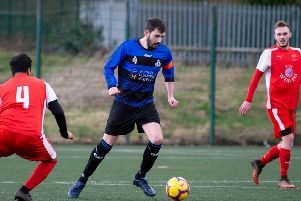 It was the side’s third win in a row after defeat in their opener away to champions Sheffield and has raised hopes of a title success with matches against Harrogate at Bradley Hall on August 5, York at Forest Park on August 19 and Teesside at Meltham on September 2 to come. Results (East Riding names first) - Foursomes: M Raybould & L Robinson bt J Morton & T Hunt 1up, N Raybould & A Lockwood lost to J Smith & M Birkett 2&1, A Wright & J Maxley finished all square with S Minto & J McAspurn, R Webster & L Hunt bt M Colcombe & G McLean 2&1, S Middleton & L Nicholls lost to T Calvert & I Turner 5&4, A Woodhead & D Digby lost to J Edwards & H Mowl 2&1. Singles: M Raybould lost to J Morton 3&2, L Robinson bt Smith 5&4, N Raybould lost to Hunt 6&5, A Lockwood bt Calvert 1up, A Wright lost to S Minto 2&1, J Maxey bt M Colcombe 4&3, R Webster lost to J McAspurn 5&4, L Hunt bt I Turner 4&3, S Middleton lost to M Birkett 4&3, L Nicholls lost to G McLean 4&3, A Woodhead by H Mowl 2&1, D Digby lost to J Edwards 2&1.